If you are going to tell me the world ends in 15 minutes, you really should mean it. Wow, what a crazy week. We were inside the polar vortex that covered a good chunk of North America at the beginning of the week and now it is supposed to be 9C (48F) today. Xander had an extra two days of holidays because of the storms. Schools closed here for the first time in 10 years. I've also either been hit with the flu or mild food poisoning, I am leaning towards the latter due to the lack of other flu like symptoms, so it has been a cuddle up on the couch and kill stuff kinda week for me. Xander, my wife, and I FINALLY finished New Super Mario Bros U. While it was really nice looking and had some interesting elements, I think the formula is tired and needs to go away for a while. Plus, I think the game is co-op hell. My wife and I didn't enjoy the playthrough much at all. Nintendo really needs to go look at Rayman: Origins to see how to make co-op work well for multiple players in a co-op platform game. Once Xander reaches some behaviour goals that come due at March Break, we'll be able to get in to Super Mario 3D World together as a family. I'm banking on that being a lot better co-op. I had a great session with Saint's Row 4 with my buddy on our game night. The number of different "games" they have you play and the variety of gameplay is extremely impressive. I think the game is really quite brilliant. We had a 5 hour session with the game and it just flew by. I can't wait until Tuesday night to play more. Certainly deserves to be on any "best of 2013" list. 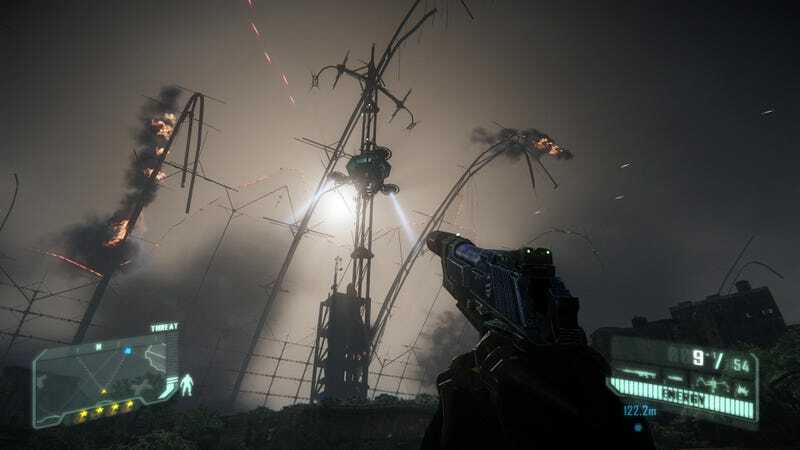 Other than that and a week filled with movies (finally watch The Avengers) and loads of True Blood Season 5 with my wife, I just been playing Crysis 3. Nvidia released some new video drivers this week and I was able to eke out a bit more performance. While I'm still not able to run the top end shaders and shadows I was able to run some better anti-aliasing and still keep a comparable framerate. This makes such a visual difference in games like Crysis 3 that have complex geometry and extremely dense foliage. So, that made me a very happy camper. I think I'm pretty far along in the game now, though I really have no idea how long the game actually is. It is pretty good. Similar in feel to the second game though still not reaching the brilliance of the first game. The story is pretty well done and actually somewhat genuinely interesting. The gameplay is tried and true Crysis, which means for me sneaking around cloaking for most of the game and knifing people in the back. It is fun and really quite a beautiful looking game. One problem I had, that I've encountered in so many other games, is the threat of imminent death or doom that never actually comes. At one point someone on the radio in Crysis 3 yells out that world is going to end in 15 minutes. So I say to myself that I should likely hurry up. However, if you are like me and the game doesn't put up a timer on screen, I tend not to worry about hurrying. I took about 15 minutes to get inside a fortress and the game then said I have 10 minutes left. I then get to the 5 minute warning about 20 minutes later and then get blown off the wall of the fortress. I survive, but I have to go all the way around to the entrance again and take another 15 minutes to get back to where I was. As I am sure you can imagine, I got to where I needed to be *just* in the nick of time. Part of this is just bad writing. There was really no need to call out actual time increments. Yells of "hurry", "soon", "almost upon us", and what ever else you can come up with more than get the point across. Most humans have an alright internal clock, so when you tell me I have 5 minutes and I take 20 minutes, I know you really didn't care if I rushed or not. And this is the problem. If a game is going to give you a timed threat, they really should stick to the threat. It is rare indeed to get a game to actually throw up a timer anymore in gaming. Having a timer makes for some great and exciting changes to the players gameplay strategies and mixes up the game itself. This would actually be a welcome change to Crysis. I am a "path of least resistance" gamer. I find something that works and I stick to it. I rarely ever use the shield ability in Crysis as I prefer to use stealth. In Crysis 3 I have 8 upgrade points I haven't spent (this is a lot for those who haven't played) because I've already upgraded all the stealth abilities and don't care about and don't use the abilities the other upgrades would give me. In Crysis, like many other stealth games, everything comes to those who wait. If you have the patience, you can stealth your way through almost the whole game to great success. Since this strategy works, I stick with it and while I do miss out on an entire other ability in the game, it doesn't bother me at all because I feel as though I am playing the game I want to play. However, if I suddenly had lots of timers in Crysis 3, this would change up my strategy quite a bit. Suddenly sitting behind a wall for 5 minutes wouldn't be an option if I had a 15 minute timer. If I has larger timers (which I would be greatly in favour of), say 1 hour to reach tower X which may span several levels, then I also would do a lot more running and gunning and I would start utilizing more upgrades, different weapons, and different options. I think it would actually enhance the gameplay of not just Crysis, but of many games, to have time as something to actually fight against. If you are going to threaten me with time in games, stick to your threats. You really lose something in your delivery and tension if you tell me to hurry but it turns out I can just take my ol' sweet time. So, hopefully more Crysis 3 for me this weekend. What are you playing this weekend?